Toyota Motor Corp., BMW AG, Daimler AG, Honda Motor Co. and Hyundai Motor Co. are joining oil and gas giants including Royal Dutch Shell and Total SA with plans to invest a combined 10 billion euros (CDN$14 billion) in hydrogen-related products within five years. Fuel cell vehicles are a cornerstone of Toyota’s plan to rid 90 per cent of carbon dioxide emissions from its vehicles by 2050. The automaker has long contended it’s more likely to convince consumers to use gasoline-electric hybrids and fuel cell vehicles rather than battery-electric autos, which tend to have less driving range and take longer to recharge than filling up with gasoline or hydrogen. 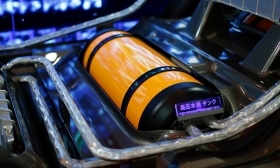 “In addition to transportation, hydrogen has the potential to support our transition to a low-carbon society across multiple industries and the entire value chain,” Takeshi Uchiyamada, Toyota’s chairman and a council co-chair, said in the statement Tuesday.